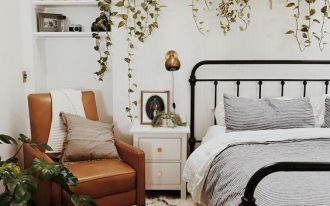 You can choose a theme for a bedroom. The theme should be your desired theme because you will be in that room. Asian themed for a bedroom is a good choice. You can make an Asian bedding, add some Asian style bedroom furniture, or Asian decoration. 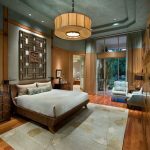 The warm touch and unique design of Asian themed bedroom will make you more relaxed. 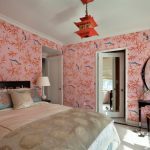 The following are some Asian themed bedroom ideas that you can make to make an awesome bedroom with the warm of Asian style. 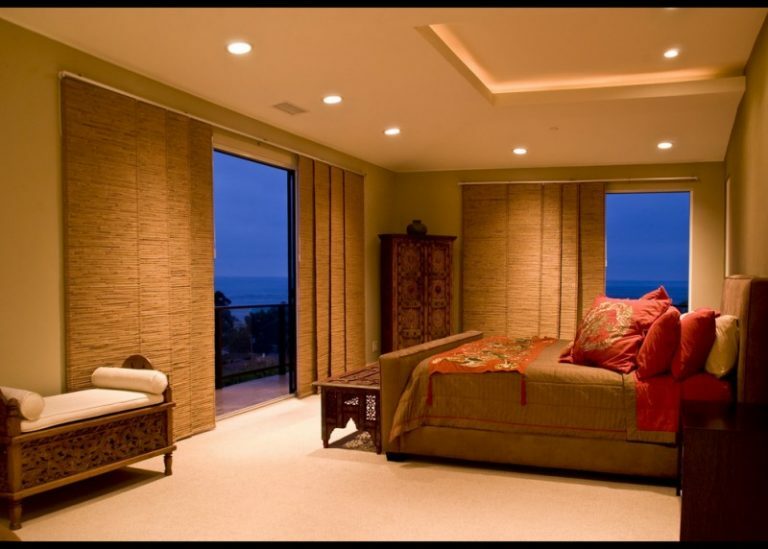 This Asian bedroom design comes with beige walls and medium tone hardwood floors. This bedroom has blue accent on the bed, chest, and above the window shade. You can put hand painted silk screen from Japan above the headboard. You can also arrange two Berlin 2-drawer nightstands beside the bed. You can use black and gold for your Asian themed bedroom. 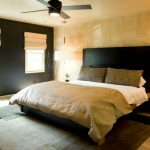 The black heavy headboard connects to the bed. There are two simple side table and drum pendants. 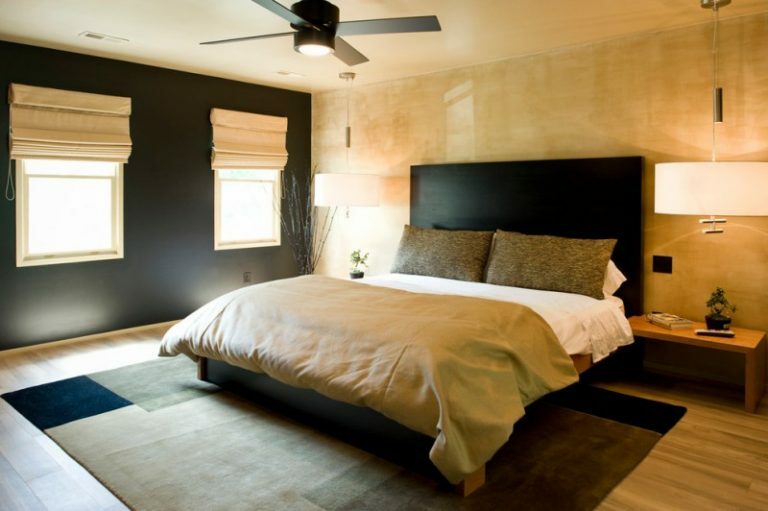 In addition, you can hang a Quarto ceiling fan with lamp in this bedroom. This bedroom looks so luxury. 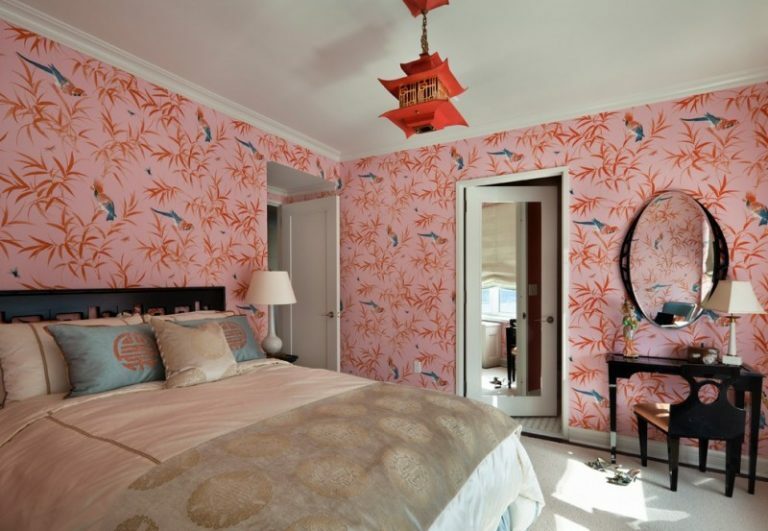 This bedroom has an interesting fusion of Asian theme and pink wall with bamboo and birds pattern. You can hang a mandarin lantern on the white ceiling. 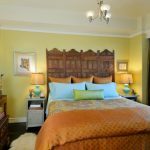 This bedroom has vintage carved Indian screen headboard, nice bedding, wide mirror, Chinese chest, beautiful nightstands, antique chandelier, yellow walls, and dark hardwood floors. The bedding features Vietnamese silk duvet cover. 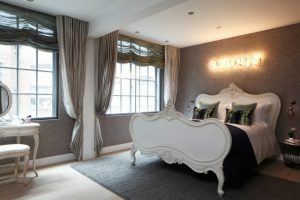 You can put custom silk drapery for your large window. 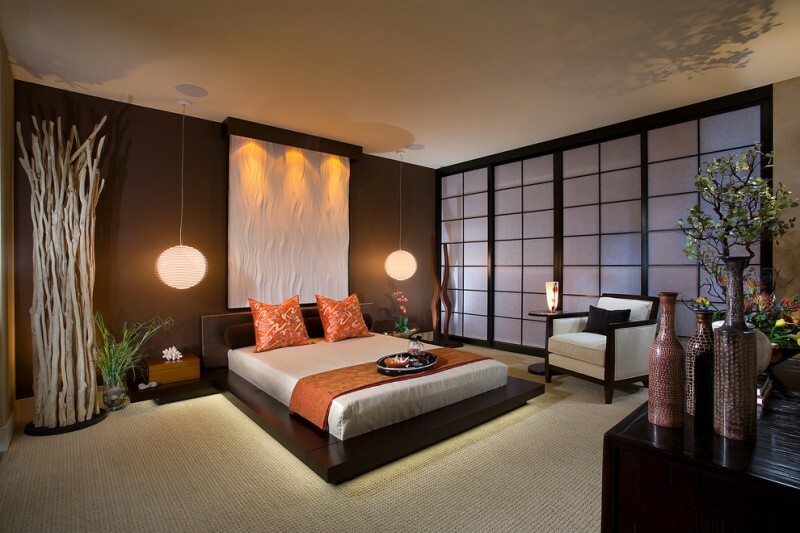 This master bedroom was designed with the Asian theme. 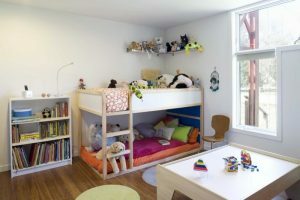 The lighting under the bed and the LED 1 light cord hung pendants. The wide screen door also looks great for this large bedroom. You can put a hard coral sculpture and flower on the side box tables as decoration. 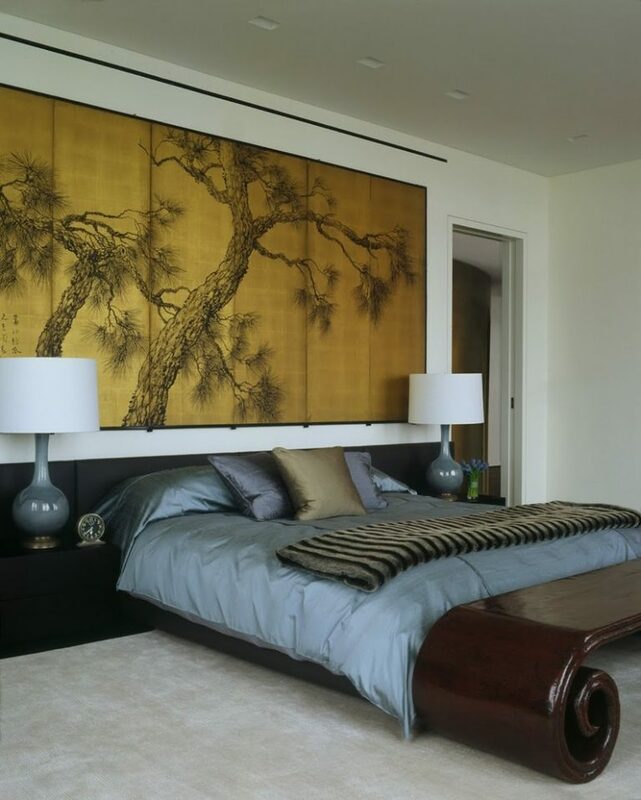 This contemporary Asian bedroom features Shoji screens, custom bedding, and Asian art. 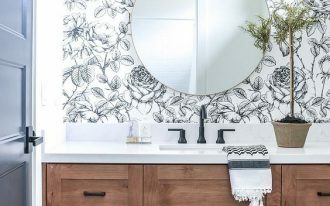 You can feel the peace in this stylish room. 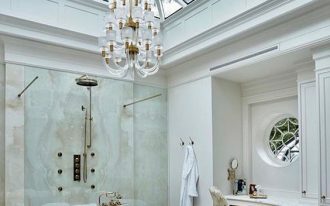 These screen doors are used as the divider between the master bedroom and its bathroom. 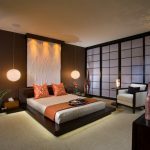 This spectacular bedroom has an Asian sliding door, Japanese style tub, the tall bed wall, black bed, built-in side tables, and the sphere lamps. 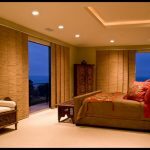 This bedroom has Asian style window and door coverings. These natural window shades suit the cream and red colors of this bedroom. You can arrange oriental cupboard in the corner and two wooden benches with white cushion. 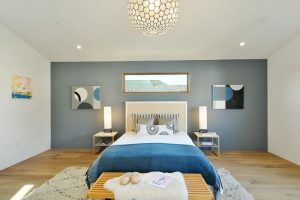 This bedroom features wicker bed, Ming chest of drawers, fine arts lamp, giant curtain, calm patterned rug, some armchairs, a small side table, Asian art on the wall, and the big sliding glass door. 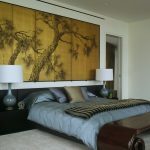 The bedroom wall can be beautified with a gold leaf Chines antique panel. It is suitable for the minimalist bedding style.